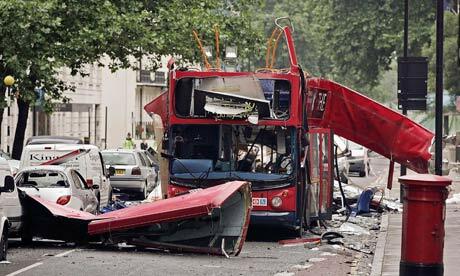 I was saddened and dismayed to read that the memorial for the victims of the terrorist attacks in London on 7th July 2005 has been defaced. We all know that Blair lied about the Iraq war but insulting the memories of the 52 innocent people who perished on that day doesn’t help one little bit to bring him to justice. Two wrongs don’t make a right. This is just sick. I have my own reasons for remembering the 7th July. One summer morning in 2005 I rose early and left my house – I was living in Nottingham then – and took a train to London. I was quite excited. I was going to be interviewed later that day for a programme in the BBC TV series Horizon called The Hawking Paradox. The filming was to take place inside the Café de Paris near Piccadilly Circus, for the simple reason that it wasn’t used during the daytime, and would therefore be both quiet and cheap to hire. I was keen not to be late so I got a train that was due to arrive at St Pancras Station in London at about 9.30am. On the train I dealt with a few bits of correspondence, filling in forms and writing out cheques to pay bills, so had a couple of items of mail to post when I got to London. The train was on time, and it was a fine morning, so I decided to walk from the station down through Soho to the location of the shoot. I crossed Euston Road and walked down towards Bloomsbury. Spying a bright red Royal Mail postbox across the road in Tavistock Square, I waited for a bus to go past, crossed the road and popped my letters into the box. I looked at my watch to see if I had time for coffee on the way to Piccadilly. It was exactly 9.45am, on July 6th 2005. I enjoyed the filming, although it took quite a long time – as these things do. Breaking for lunch in a local pizzeria, we were surrounded by a hubbub of excitement when news broke that London had been awarded the right to stage the 2012 Olympics. We finished the filming and I headed back to Nottingham on the train. All in all it had been a very pleasant day. The terrible events of 7th July 2005 took place the day after my trip. Here is a picture of the postbox in Tavistock Square taken on 7/7/2005. The bomb that tore the roof off the bus and killed 13 people went off at 9.47am, almost exactly 24 hours after I had been in precisely the same spot. What a difference a day makes.